Summary: A twin girl named Mali is caught by a water spirit assassin, but she turns out to be the wrong twin. Obviously, she lives (I mean if she didn’t, there would… be no book), and she ends up helping the water spirit assassin, Nahla, try to find her missing twin. But what Nahla doesn’t know is that Mali is an assassin* too, and Nahla is her target. 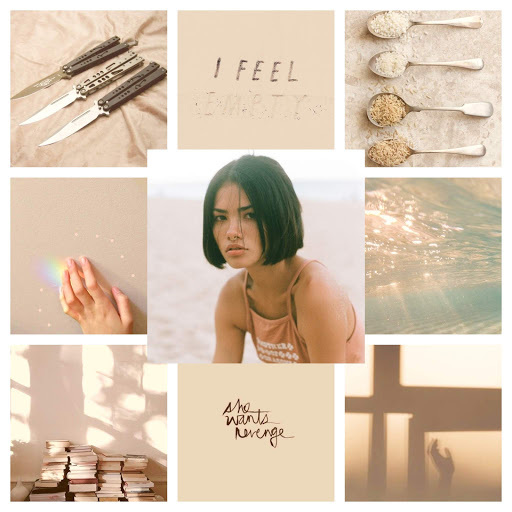 Themes: I’m big on writing a lot of themes into books, so some of the themes I’m hoping to write about in this WIP is making peace with yourself and your past, finding comfort even where you don’t think it’ll be, and being content with who you are. I brainstormed ideas by randomly thinking of aesthetic things that I wanted to incorporate (like water, drowning, knives, sapphic romance, etc. ), which seems to a very effective method for me since this is my second time doing it and it worked?? *Okay she’s not TECHNICALLY an assassin but let me live. Here are the main characters of my WIP!! I’m lowkey questioning if I talked too much about them but also?? who cares. I love them and I’ll talk about them forever. Also am I sorry for comparing them to Six of Crows and Foxhole Court characters? No. And I DO have a character aesthetic… but only one. I’ll show it later but they take fOREver for me to make so that’s why there’s only one!!! So the only snippets I really have are from a scene I wrote last month because I was very excited about it, what I wrote while planning, and my outline (which is basically non-existent). And this one is a character aesthetic for Mali that took me two hours to make!!!! But I’m very proud of it and the fact that I manged to find images that actually related to who she is. I’ve been having a really rough time with planning out this WIP because I’m 1) horrible at plot and 2) I haven’t planned/written a proper WIP in SO long. So I had to turn to some resources, and I always find it helpful whenever a writer shares a list of resources they used, so… here’s mine??? are you working on a WIP? if so, what’s it about? or do you write something else? are you participating in NaNoWriMo? how long does it take for you to make aesthetics??? and does anyone want to make one for me?? Next Celebrating Kingdom of Ash’s Release by Sarcastically Responding to All the SJMess Stans that Attacked Me Last Week! And hahahaha, I get you with names! My WIP was titled “F/F Hate To Love Romance” for… wayyyyy too long. (The romance isn’t even THAT big a part of the story!) And my characters didn’t have names for the LONGEST time, and got referred to as Rebel, Queen, and Nameless Boy. For so long that when they finally got names, and I referred to Nameless Boy by name, my friend was like “Who? !” but immediately knew who I meant when I referred to him as Nameless Boy. It takes me forever to come make an aesthetic, but it’s worth it in the end because. ITS. JUST. SO. BEAUTIFUL. omg thank you so much Jessica!! And I wish you the best of luck with NaNo — I’m really stressed as well but I’m excited to see how much I can accomplish! Ugh, you’re always so helpful and considerate when you write posts like these because you always detail what websites you use to aid your writing! I’m so excited to use well-storied, I’ve never heard of it before! This sounds soooooo good! Looking at your characters I’m feeling relieved that I’m not the only LGBTQ+ author who writes a lot of diversity into their books! Ah, I love this! It sounds so good and I think the banter will be amazing! And yay for demi-bisexual because we need more representation! Aww what, you’re a queen more than I am, LOOK AT THESE AESTHETICS. SO in love. This sounds incredible. I want it. Stat please. Also, I’d be happy to make a character aesthetic for you! I’d need some prompts on the character basis of course, but other than that I’d love to! Omggg thank you so much, Rhi!! This is so kind and I’ll definitely be sharing a bit more about my WIP during NaNo ❤ And aahh that would be amazing, though I don't want to overload you or anything! If that’s too much hassle don’t worry – I have another **secret** option! This sounds like an incredible WIP May. ❤️ I’m sure you’ll have a lot of fun working on it for NaNo, and I hope to hear more about it again as well. Also now I’ve read the All for the Game trilogy I have a better idea of who your characters are (not that the Six of Crows cues didn’t help too). Your aesthetics are gorgeous, but yeah I get what you mean because I’ve been avoiding Pinterest while I try and plan my NaNo WIP. It’s so easy to fall into a black hole of sorts when it comes to Pinterest and aesthetics right? Yep, finished it a week or so ago, and loved it. Aww, thank you so so much, Aditi!!! This all means the world to me 😭💗 I’m so happy you like my WIP!! hi hello ok where’s the “read unfinished wip because why the hell not” button because i need to read the unfinished WIP because why the hell not! (because it’s unfinished, nimika, shut up). MAY THIS IS ABSOLUTELY INCREDIBLE WOW WHAT A STAR YOU ARE!! i can’t wait to read this as soon as you write it!!!!! dang like everything you wrote just made me so excited that i’m actually sad this is not a published book yet. good luck in nano! I’m participating in NaNoWriMo too! Good luck! Ahhhh May!!! Nahla and Mali sound so badass and precious 😍😍 I’m so excited to see you accomplish NaNoWriMo this year (because you TOTALLY would!! 💪) Good luck!!! Oooh! I would love to read your book! It sounds amazing! Are you planning on participating in Nanowrimo? I have a WIP that I’m about 5,000 words into. Oh, wait you are participating! I must have missed that snippet! Yay, I’m participating to but I’m not sure how much I’ll get written. Good luck! Pingback: Bookish Naughty Or Nice Tag!